The village fete crowd scene at Broughton House depicts smartly dressed men, women and children. 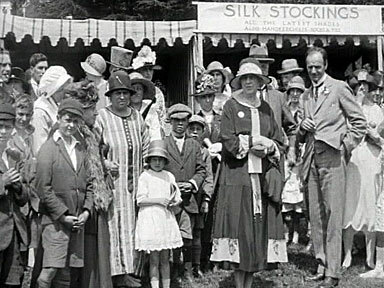 The film shows a variety of hats including bowlers, cloche, bonnet, baker boy cap and top hats made from materials such as straw, felt and cotton and decorated with flowers and hat pins. The cloche hat has become an iconic symbol of the 1920s, as referenced by Michael Arlen in his novel, ‘The Green Hat’ (1924). The clip shows a woman dancing in a grass skirt. It conveys an exoticism that is reminiscent of the celebrated performer Josephine Baker who danced at the Folies Bergères in Paris. This image conveys the contemporary spirit of patriotism. The women wear Union Jack aprons and the stall has a row of flags at the front. It serves tea which is the quintessential British beverage. The Bognor Regis Carnival of 1936 saw 18-year-old Barbara Morrison crowned as Carnival Queen by Lady Cobham, the wife of the famous aviator Sir Alan Cobham. Her costume comprises a dress, a cloak with a fur collar and trim and a crown. Carnival costumes varied across the country. There is a photograph held in the Dartmoor Archive (Acquisition no: DA103269) that shows a 1930s Carnival Queen, Muriel Clarke who wears a satin dress with train and a coronet. Without a cloak, Clarke appears less regal than the Bognor’s Carnival Queen. The 1st of May has been day of celebrations in England for centuries, originating in a pre-Christian celebration of the first day of summer. It has had strong associations with fertility and traditional aspects of celebrations on the day include dancing around a maypole and the crowning of a May Queen. From the late 1800s it became International Workers’ Day and was later designated a UK Bank Holiday. 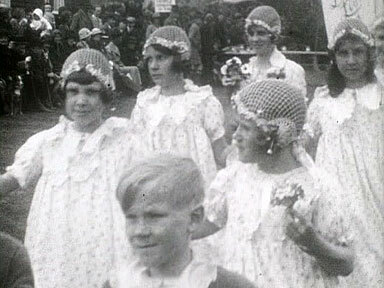 The young girls acting as May Queen attendants in this clip wear floral dresses and crocheted caps which can be seen more clearly in this still image from the film. The Worthing Museum & Art Gallery dress and textile collection has a May Queen Attendant’s dress from c.1930. 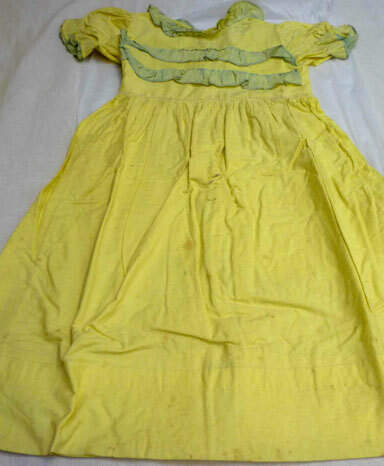 It is made of yellow cotton and has strips of green ribbon attached to the bodice and collar. These colours represent the season and recall spring flowers such as daffodils, buttercups and dandelions. 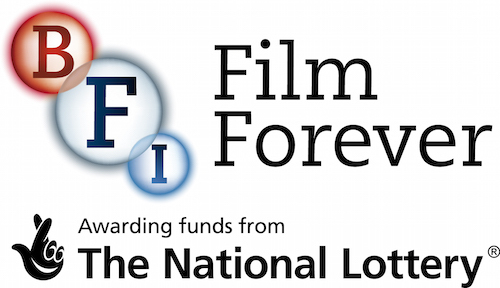 The British Film Institute has a film called ‘Springtime in an English Village’ (1944) which shows a young black girl being crowned May Queen. Empire Day was celebrated annually on 24th May. It first started in 1902 as an event to promote British values but was not taken up as a national event until during the First World War. The event naturally declined in the 1950s as former British colonies gained their independence. 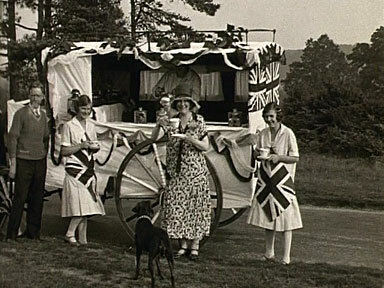 It was first devised to remind adults and educate children about the significance of the British Empire and often featured a local girl or woman dressed as the fictional figure of ‘Britannia’. ‘Britannia’ would also make appearances at May day events and other festivals. 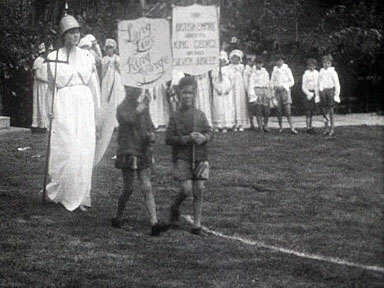 This still image is taken from a film of the Egerton May Festivals of 1935. It shows a young woman dressed as Britannia with her associated regalia and helmet. The boys carry placards that celebrate the Silver Jubilee of King George V which also fell in May 1935. 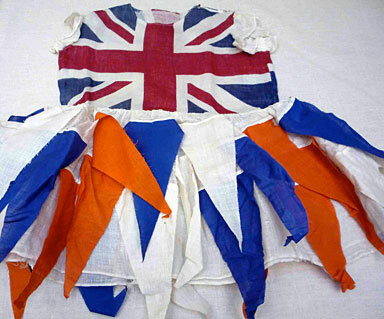 The Worthing Museum & Art Gallery dress collection contains a costume from Empire Day celebrations – a Union Jack dress, which was worn by a young girl, who was possibly part of a group dance.